By now, the dust has settled from busy season 2012. How are you feeling about yours? 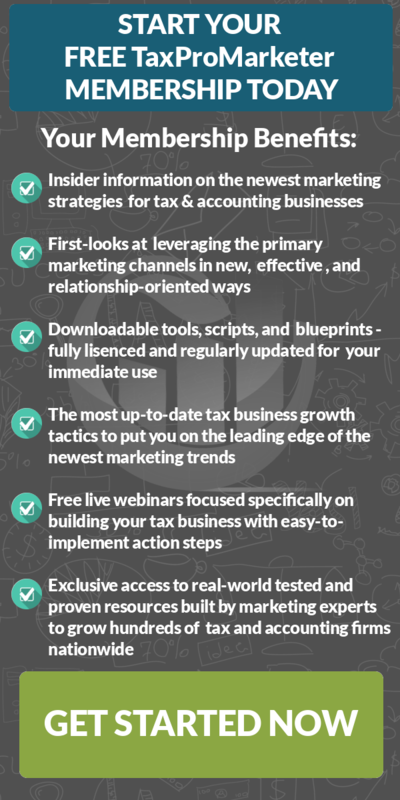 Now really is the time for you to take a step back, evaluate your successes (and failures), and take a clear-eyed look at how you and your firm will improve for next tax season, bring in additional revenue during the “offseason”, and, of course, seal in your new clients so that they stick for life. We’re getting notes from clients, thanking us for the work we did on their behalf — and nothing makes me happier than to know that we’ve served you well. 1) Thank your clients. Even through something as simple as a (warm & personal) email, you’d be amazed at what it can do for retention and referrals. A print newsletter, a gift — whatever it is, make it light, make it “non-sales-y”, and make it warm. be it revenue or efficiency considerations), and create a profile of them. This will help you adjust your positioning to gather even more of them. Next, evaluate what services you should be providing, based on need (or desire!). Again, the return information will greatly help you here. Section 7216 specifically allows for such data mining, as long as it’s for internal (research) purposes. Do you have a lot of clients nearing retirement? Then consider adding some sort of tax-planning package for soon-to-be retirees. Clients with kids nearing college? Investigate offering college financial planning services. Business owner clients? Make sure they are set up with a succession plan. Etc. Etc. The point is that you have a HUGE advantage over other service businesses, in that you have so much real info at your fingertips. For OUR concierge clients, we’ll be discussing these issues (and taking your questions) on our coaching call next week. I’ll send you those call-in details early next week. I hope you’ve been enjoying your well-deserved break/slow-down … but now is really the time to begin setting the table for a longer-term breakthrough.